You´ll Never Walk Alone is the anthem of Liverpool Football Club, but it´s more than just an anthem. The lyric of the song tells us to hold our heads up high as we walk through a storm, to walk on through the wind and rain towards a golden sky. Ask any fan what the song means for them and they´ll tell you it´s about pride, passion, never giving up, persevering through the good times and the bad. It represents friendship, inspiration and dignity. It´s more than just an anthem, it´s an attitude, a way of life. It was sung at half time in the 2005 Champions League Final against AC Milan when all but the most blue skied of optimists believed Liverpool were done for. 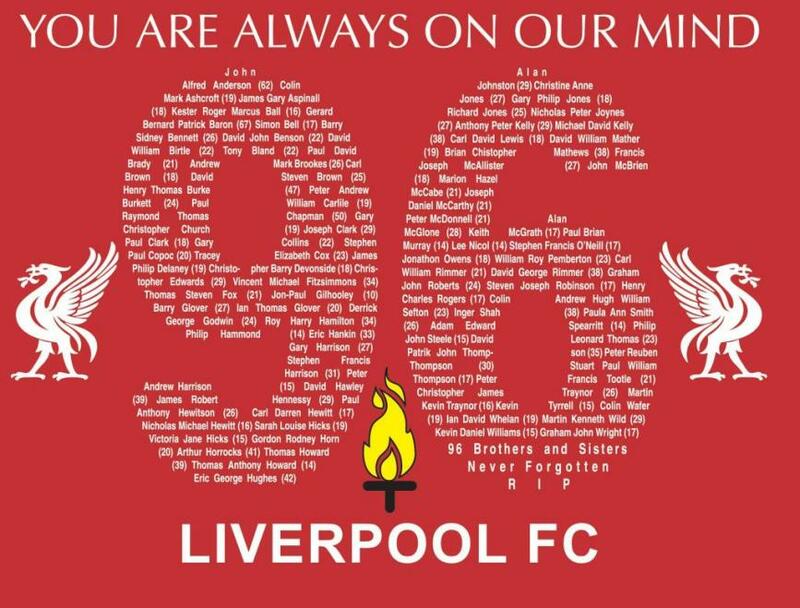 It´s just recently reached number 1 in the iTunes download charts and number 12 in the UK Charts as a tribute to the 96 fans who lost their lives in the tragic FA Cup Semi Final between Nottingham Forest and Liverpool FC in 1989 in Hillsborough. 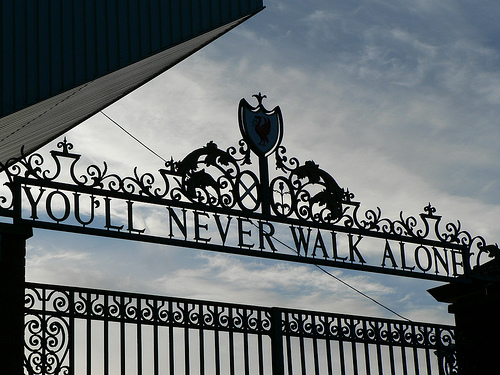 The words Youñll Never Walk Alone feature on the club crest and on the Shankly Gate entrance to Liverpool´s Anfield Stadium. You don´t have to be a Liverpool fan or a football fan for the hairs to stand up on the back of your neck when you hear it. Music gives meaning to our lives, and it´s coloured by the events in our lives. It´s a glue that bonds people together. The feeling of togetherness you get at a concert for your favourite band is not the same as the one you get when you are in a conference, even if its one you´re really interested in. You´ll Never Walk Alone has taken on a significance that far outweighs the original inspiration. It´s been on a journey since it was first written. It´s now associated with Liverpool FC for many, but it wasn´t always that way. Like every song, You´ll Never Walk Alone has a story to it. It was written in 1945 by the great American songwriting team Rogers and Hammerstein for their musical Carousel. 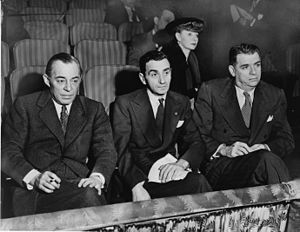 That´s Richard Rogers above on the left, Oscar Hammerstein II on the right and another songwriting great Irving Berlin between them. Behind sits choreographer Helen Tamiris as they watch auditions together at the St James Theatre in 1948. The first artist to record a version of it after the musical soundtrack was released was Frank Sinatra in 1945. He reached number 9 . It´s since been recorded by Elvis Presley, Ray Charles, Nina Simone, Johnny Cash, Louis Armstrong, Bob Dylan, Placido Domingo and Judy Garlan to name a few. Still, the definitive version has to be the Gerry and the Pacemakers cover of the song in 1963. Gerry and the Pacemakers were one of the Liverpudlian Merseybeat bands who along with Cilla Black and others had the same manager, Brian Epstein, and producer, George Martin, as The Beatles. 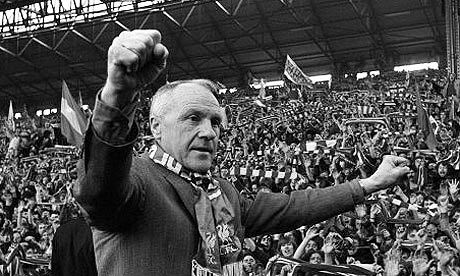 Marsden told the BBC in the 1960´s that the DJ at Anfield would generally play the top 10 singles of the time in ascending order before kick off, but after You´ll Never Walk Alone dropped out of the top 10, the fans kept singing it moments before kick off… a custom that continues to this day. The song was their third single, and initially neither George Martin or Brian Epstein thought it was worth recording, because they believed it was too slow to be a hit. It had been a favourite of Marsden´s since he saw Carousel as a kid. 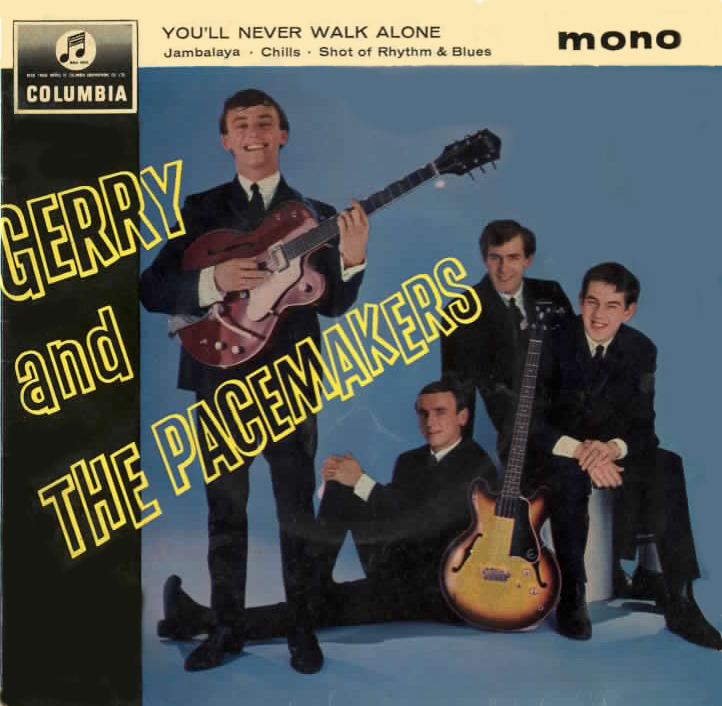 Gerry and the Pacemakers were the first group to reach number one with their first three singles, a feat that wasn´t equalled until 20 years later when a fellow Liverpudlian band Frankie Goes to Hollywood would do the same in the mid 80`s, but you can all Relax, I´m not going to do a song of the week about them. If you want to read more about the song and its relationship with Liverpool FC, you can read a piece Bob Pearce wrote about it for the online magazine, The Tomkins Times here. A campaign to get the song back into the UK Charts was started by Liverpool Walton MP, Steve Rotheram following the release of Friday´s Hillsborough Independent Panel report, which revealed that police had tampered with witness statements and tried to pass the blame for the tragedy onto the victims themselves. After 23 years of fighting for justice, the families of the 96 fans who died have only now been allowed access to the truth. The revelations in the documents prompted a “profound apology” from the Prime Minister David Cameron for the double injustice suffered by the families. You can read his statement here. Let´s hope the families get the justice they deserve. “Music gives meaning to our lives, and it´s coloured by the events in our lives”. Says it all. Great post and thanks for the memories. Thanks for reading Paul. Cheers for the comment! No worries at all. Thanks for reading them. I actually had to write this one twice from scratch as the first post disappeared. There are more … songs … in heaven and earth,Than are dreamt of in … our … philosophy. I am fascinated by this story. Cheers Wanda. There sure are plenty. No shortage of songs to write about. 🙂 Thanks for the comment! I’ve not listened to this song before. It speaks volumes. Thank you for including it in your blog. So many believe that they walk alone on their path but I feel that belief is a mistaken one. To open our eyes and hearts to what surrounds us can be frightening but when it happens ppl see that in fact their path is quite crowded. No worries. Thanks for taking the time to read the blog and listen to it. I´m a Liverpool fan as well, so I like the song on many levels. Is that football? or am I way off? http://youtu.be/OV5_LQArLa0 A new video has been released for You´ll Never Walk Alone. http://www.liverpoolfc.com/news/latest-news/148182-gerry-marsden-why-ynwa-is-special-to-me From the man himself, Gerry Marsden.